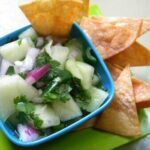 A light, fresh honeydew salsa that goes well with almost anything from chicken to chips. Be careful, it's addictive. Combine all ingredients and allow the flavors to blend for 30 minutes.